"Do you ever really know anyone?" After his ex-wife Juliette dies, Manhattan criminal defense attorney Peter Caine's fifteen-year-old son Jamie comes to live with him and his girlfriend Claire. Peter had enough trouble as it was with his long-time enemy DA Harrison Doyle as well as with a former client who was just paroled, but when Peter's on-and-off mistress Charlie - the DA's stepdaughter - is murdered, Peter's carefully planned life is about to unravel. In the world of thrillers, serial killers abound, but I've recently developed a taste for sociopaths. When done correctly, they are way more interesting, because more live among us than we would like to acknowledge; this is what A.F. Brady has done with the stunning ONCE A LIAR. Told in the first person from Peter Caine's POV, the narrative smoothly alternates between the present day and past. This psychological thriller is well written and flawlessly edited; the dialogues are excellent and I marveled at the unique and distinctive voices of the characters. The book is evenly paced - not slow but not barreling at a furious pace either until we reach the shocking conclusion. I must admit that Ms. Brady had me completely baffled, and I had absolutely no inkling as to who was guilty of what. Peter is a sociopath, and Ms. Brady did a terrific job at conveying Peter's state of mind. I was also pleasantly surprised that the author, who is a woman, channels an entirely convincing male voice. The story is tightly plotted, and it's only when you get to the conclusion that you realize how meticulously the story was planned, and how necessary the Now and Then were in making the whole thing crystal clear in hindsight. For a good while I thought that there might have been a little something missing, that it lacked a little oomph, but as ONCE A LIAR gathers its momentum and nears the end, there was more than enough oomph to compensate. In fact, getting there was crucial, as all that happened "then" matters "now." Peter is not a very appealing man, which is to be expected under the circumstances, and yet his story kept me riveted because of the uncertainty, right from the first pages. The characters are wonderfully defined and held more surprises than I could ever have imagined; this goes for on particular secondary - Sinan Khan - a partner in Peter's firm. 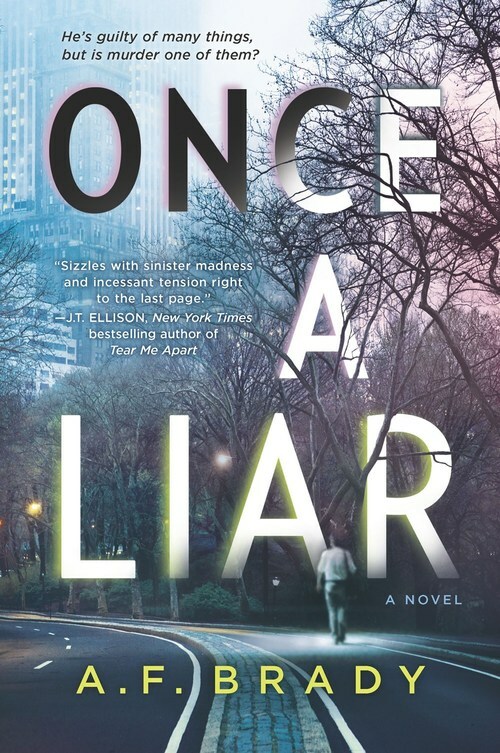 If you're craving for something different, ONCE A LIAR is just the book for you! American Psycho meets Behind Closed Doors in this electrifying psychological thriller, in which a high-powered sociopath meets his reckoning when he's accused of the brutal murder of his mistress. Did he kill Charlie Doyle? And if he didn't� who did? When Charlie Doyle, the daughter of the Manhattan DA�and Peter's former lover�is murdered, Peter's world is quickly sent into a tailspin. He becomes the prime suspect as the DA, a professional enemy of Peter's, embarks on a witch hunt to avenge his daughter's death, stopping at nothing to ensure Peter is found guilty of the murder.